With over 20 years experience in tuning the YB Cosworth engine, we can offer a range of tuning packages to suit your requirements. We can live map the Weber management ECU perfectly to match your engine spec and upgrades ensuring all modifications are carried out to our usual high standard giving your Cosworth the best possible performance gains whilst maintaining a high quality, reliable and safe running engine. We offer tuning stages up to 500 BHP and custom engines right up to 800+ BHP however, as I am sure you are aware, conversions this high are truly bespoke and is never as simple as listing the developments we do in order to get to such high power. It would be best contacting us to discuss your requirements where we will be more than happy to advise you getting the best out of your Cosworth engine. This consists of changing the turbo actuator, spark plugs for colder units, rewiring the fuel pump if required, and the remapping of the vehicle to increase boost to 14 psi. Although not strictly necessary we usually also change the exhaust to a 3inch stainless item and fit a panel filter in the std box, or a new cone filter. It is advisable also to check the condition of both water and boost hoses as they do tend to perish due to old age, and we would suggest the replacement throughout with new Roose Silicone hoses. We comprehensively go through the engine management to ensure the wiring loom and ecu are still fully functional and replace any sensors as required. If the engine loom is found to be in poor condition we manufacture our own bespoke engine looms for these vehicles. This is an evolution of the stage 1 setup, and whilst this can be performed using std injectors, we recommend changing to a new set of Bosch 803 injectors, due to the old age of the original items. With all the items mentioned in the stage 1 setup and still utilising the std 2 bar map sensor, the boost is mapped via the ecu to give a midrange overboost of 20psi, before tailing back to 16psi at the rev limit. This setup gives much stronger midrange torque (320lbf ft) over the conventional stage 1 setup and has long been the favourite of many std car owners as it maintains the original appearance. 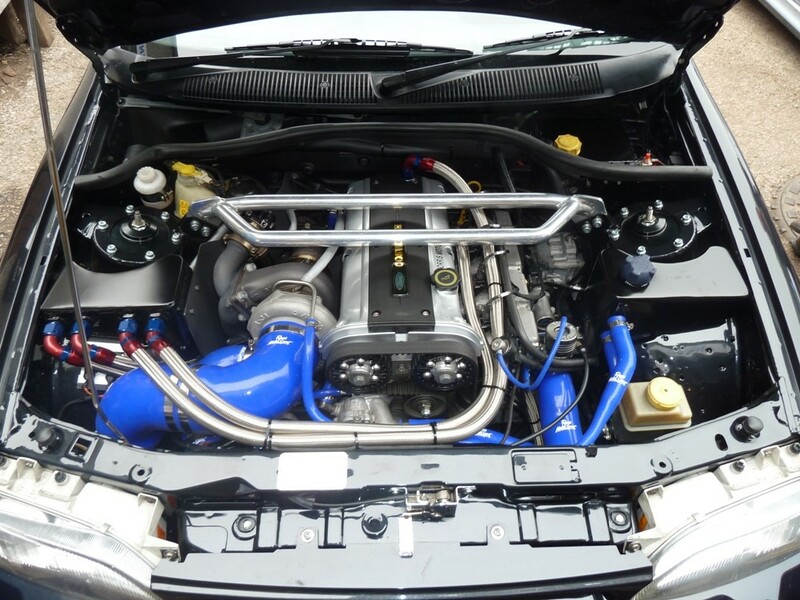 Tested by Performance Ford when we originally developed this conversion back in 2002 at Bruntingthorpe, on two 3dr Sierra Cosworth’s we managed 0 – 60mph in 5.0 seconds, 0 – 100mph in 12.3 seconds and a top speed of 156mph! At this stage we install higher flow rate injectors and a 3 bar map sensor. We comprehensively remap the management, with boost controlled via the ecu to give a midrange boost of around 24psi before tailing back to 20psi at the limiter. Whilst not strictly required we do advise the fitment of a T34 turbo on 2wd Sierra’s to cope more reliably with this boost level. The 4X4 T3 Turbo is usually ok at this level as long as it is in good condition. We also suggest fitting a 4X4 intercooler to the 2wd cars at this power level. This is the practical limit of the std engine, and is similar to the stage 3 setup, except with the addition of a larger turbo. (either 0.63 T35 or NMS spec T04b) An uprated intercooler, silicone boost and water hoses, 3inch exhaust, larger injectors, and suitable fuel system are required, the car is comprehensively remapped to around 30psi midrange, tailing to 25psi at the limiter. Usually an uprated 6 paddle clutch is also required. Beyond this power level, engine modifications must be made in order to increase power further, which are covered in the engine rebuilding section. In addition this is the reliable limit of the std gearbox in 4wd cars, so see the transmission section for suitable upgrades when running in excess of 400bhp. For power gains above 450BHP we have more information in our engine build sections, however it would be best to contact us to discuss your project and advise accurately what is requirements for this sort of power. We have built many Cosworth engines which produce over 500BHP and have a wealth of experience in doing so. For more information you can also take a look at out engine builds section which talks more about what we do to build engines which can produce this sort of power. In addition we recommend changing the engine management, our preference being AEM Infinity, although we are happy to use the L8 Weber Marelli up to 600bhp if all management parts are in excellent condition. 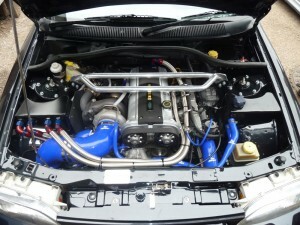 For big power engines up to 1000BHP please see our Cosworth engine build section. We also manufacture our own new Cosworth Engine Looms.